This is not supposed to make us feel guilty, but rather help up to open our eyes and see what we do have rather than what we want or think we need. It can be so easy to get stuck in our own little world and forget how big the world actually is. I was caught up in my own little world last week, wishing I could buy a new camera right now and throwing myself a lovely little pity party. In fact, I was partying hard and woke up with a very groggy outlook. It was time to open my eyes again to the world and refresh my perspective. What did I realize? I am very wealthy! I am incredibly fortunate to have all that I do...health, education, relationships and a place to call home. Even upon remembering these things, I find it easy to think of myself as "not very rich", but guess what? I am in the top 10% of the richest people in the world! In my mind, it doesn't seem possible, but it's true. 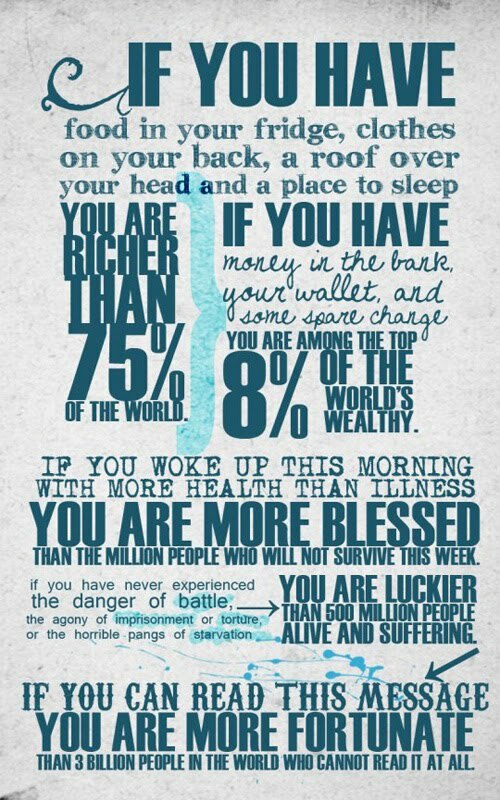 How rich is your perspective of your "wealth"?